A chance to experience another culture! 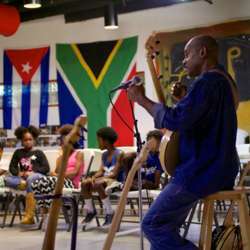 Through the use of voice, drum, banjo, and guitar, guitarist JAWAD and African drummer Joseph demonstrate two basic elements of music: rhythm and melody. The history and evolution of the drum and stringed instruments are discussed, as well as their contribution to these basic elements. The true meanings of tone, pitch, rhythm, and melody will be on showcase as part of a collective, interactive performance piece. FEE: No Cost to Attend – FREE. Please visit the registration link above to secure your free ticket.